William Tarrant alias Terry was born in Oxford in 1788 and baptised at St Peter-le-Bailey Church on 28 December. He was the son of Michael Tarrant and Esther Crapper, who had four other children baptised at that church: Ann (1779, buried there 1780), Martha Ann (1781), John (1782), and Noah James (1791). William's father Michael Tarrant alias Terry died at the age of 35 and was buried at St Peter-le-Bailey churchyard (now under Bonn Square) on 26 May 1792. His wife Mrs Esther Tarrant/Terry took over the running of the Oxford to Faringdon carrier service from New Inn Hall Street. On 24 July 1797 Esther had William's older brother Michael Tarrant (baptism not found) apprenticed to the Oxford clothes scourer Noah Crapper. On 19 January 1799 she placed the following notice in Jackson's Oxford Journal: “LOST. On MONDAY last the 14th of January Instant, 1799 Between Fyfield and Abingdon, Berks, A Large FLAG BASKET, containing Linen and other Articles, belonging to ESTHER TERRY, Abingdon & Faringdon Carrier. Whoever will bring the said Basket, with its Contents. to Mrs. Terry, New Inn Hall Lane, Oxford, shall receive 10s. 6d. Reward.” William's mother Mrs Hester Tarrant died at the age of 51 in April 1803 and was buried in St Peter-le-Bailey churchyard on 1 May, leaving William (12) an orphan. A year later on 28 April 1802 William (13) was apprenticed for seven years to the Oxford cordwainer Samuel Moore. His brother John, baptised as John Terry, died aged 22 in 1804 and was named John Tarrant in the burial register. Ann Evans was born in Drayton, Berkshire in 1794 and baptised there on 29 June. She was the daughter of Joseph Evans and Hannah Grainger, who were married at Steventon on 9 August 1789. Samuel John Tarrant (born in St Ebbe's parish, Oxford in 1840 and baptised at New Inn Hall Street Methodist Church on 17 May). The Tarrants, who were Methodist, began their married life in St Peter-le-Bailey parish in Oxford. Willilam was admitted free on 8 May 1812, and by 1814 had moved to St Aldate's parish. On 8 October 1819 William Tarrant took on Noah James Tarrant as an apprentice cordwainer: if this was his brother of that name, he was aged 20. He was to take on at least two more apprentices: Joseph Blagrove on 18 August 1825 and William Price on 7 December 1838; the Charles Blagrove apprenticed to William Tarrant on 26 July 1841 could equally have been either his or his son William Tarrant junior's apprentice). Willilam Tarrant senior was listed as a boot & shoemaker in St Aldate's in Pigot's Directory for 1823/4 and 1830. Robson's Commercial Directory for 1839 gives the more precise address of 18 St Aldate's Street. On 10 April 1833 at St Aldate's Church, Oxford, William Tarrant junior married Mary Ann Mobley. They were both described as being of that parish, and the witnesses, William & Ann Tarrant, were probably William junior's parents. William junior (21) was admitted free on 20 December 1833, followed by their second son Josiah on 26 July 1841, and their third son Alfred on 23 July 1847. The Tarrants were still in St Aldate's parish in May 1837, but by 1840 they were in St Ebbe's parish, probably in Speedwell Street. In the third quarter of 1838 in Oxford, Josiah Tarrant married Emma Green. At the time of the 1841 census William (aged about 50 and described as a cordwainer) was living at Speedwell Street with his wife Ann (aged about 45) and their children Ann (24), who was a dressmaker, and Alfred (16), Joseph (12), Benjamin (5), Isaac (3), and Samuel (1), plus an apprentice William Morris (where the name William Price would have been expected. Their older daughters Margaret (18) and Esther (14) may have been out to service, but are hard to find. On 18 December 1842 at St Ebbe's Church, Oxford, Margaret Tarrant married Harry Wethered or Weatherhead, who was born in Middlesex in c.1820, the son of John Wethered: both were then living in Speedwell Street. In 1845 the Church of Holy Trinity was consecrated, and Speedwell Street was taken into this new parish. In 1851 William (63) was at home in Speedwell Street with four of his children: Alfred (26), who was a college servant, and Esther (24), Isaac (13), and Samuel (11). His wife Ann (57) was staying with Alfred and Elizabeth Andrews, a brother and sister living in St Clement's Street, and was presumably looking after one of them, as she was described as a nurse. Their son Joseph Evans Tarrant (22) is hard to find in the census. On 25 December 1851 at New Inn Hall Street Methodist Chapel, Oxford, Ann Tarrant married Charles Henry Rooke, a joiner of St Aldate's Street, born in 1825, the son of the builder William Rooke. Gardner's Directory for 1852 lists William Tarrant as a shoemaker at 18 Speedwell Street. Their three youngest sons Benjamin (19), Isaac (15), and Samuel (12) emigrated together to Australia in December 1853. Their married daughter Ann died in 1854, and her husband Charles Henry Rooke also emigrated there with their son. On 14 May 1855 at St Peter-le-Bailey Church, Oxford, Joseph Evans Tarrant of Garsington married Caroline Brownlow of that parish, the daughter of the bookbinder Charles Brownlow. He returned to Australia with his new wife soon after the wedding. At the time of the 1861 census William Tarrant (73), described as a retired shoe maker, was living at 6 Cambridge Terrace, St Ebbe's with his wife Ann (67) and their son Alfred (35), who had no occupation, plus a boarder, John Deadman. 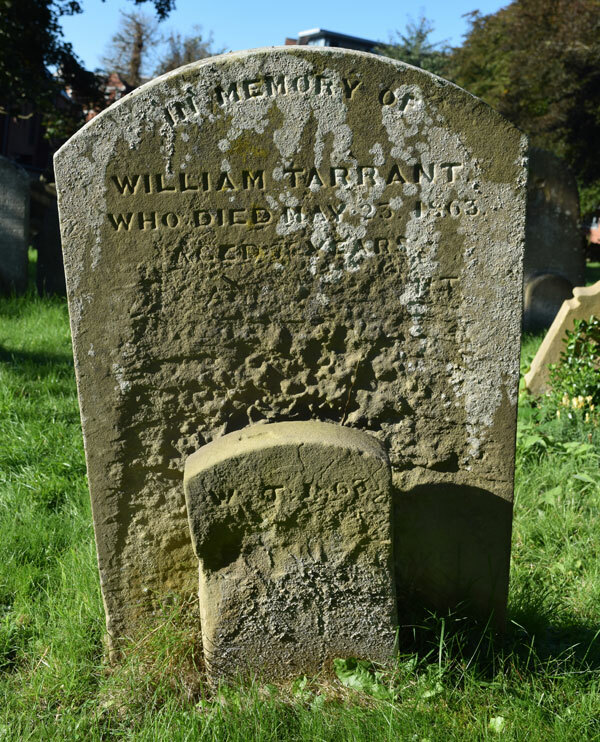 † William Tarrant died in the Holy Trinity district of St Ebbe's parish, Oxford at the age of 75 on 23 May 1863 and was buried at St Sepulchre’s Cemetery on 28 May (burial recorded in the parish register of St Mary Magdalen Church). It is unclear why he was buried in St Sepulchre's rather than Osney Cemetery. In the second quarter of 1866 in the Abingdon registration district, Alfred Tarrant married Mary Allam (born in Culham in c.1830). In 1868 their daughter Esther emigrated to the USA with her husband and their six children. † Alfred Tarrant died at Cambridge Street in Holy Trinity parish at the age of 44 (recorded as 45) on 15 August 1869 and was buried at St Sepulchre’s Cemetery on 21 August (burial recorded in the parish register of St Mary Magdalen Church). He was described as a college bedmaker at Christ Church at the time of his death. His effects came to under £200, and his wife Mary was his executor. † Mrs Ann Tarrant née Evans died at Paradise Square at the age of 80 on …Aug/Sep 1875 and was buried at St Sepulchre’s Cemetery on 4 September (burial recorded in the parish register of St Mary Magdalen Church). William Tarrant junior (born 1812), who was a shoemaker like his father, and his wife Mary Ann had their first child, Mary Ann Tarrant (who was born in St Giles's parish in 1835) baptised at New Inn Hall Street Methodist Church on 13 December). They then spent some time in London, and their daughter Esther Anne was born in Marylebone in c.1837, and Elizabeth in Paddington in c.1839. Their next child, William, was born in Oxford at the end of 1840, and at the time of the 1841 census they were living at Gloucester Green with Mary Ann (5), Esther Ann (4), Elizabeth (2), and William (four months). Just after the census, on 18 April 1841 they had all three of their younger children baptised together at St Mary Magdalen Church. From 1841 to 1852 directories list William (38) and Mary Ann (41) at 26 St Giles's Street (one of the houses demolished to make way for the Mathematical Institute). They were there in 1851 with their children Esther Ann (14), Elizabeth (12), William (10), and Joseph (eleven months). Their daughter Thirza was born the following year. In 1857 William (44) and Mary (46) emigrated to Australia, arriving at Victoria on 2 September with their children William, Joseph, and Thirza. William died in Sydney in 1884. Ann Tarrant, Mrs Rooke (born 1816) and her husband Charles Henry Rooke had one child, John Roberts Rooke, born in Bath near the beginning of 1851. She died in Bath at the age of 1854 (registered fourth quarter, with her name given as Ann Tarrant Rooke). Her husband emigrated to Australia with their son. Josiah Tarrant (born 1818), who was a cordwainer, and his wife Emma were living at Observatory Street in St Giles's parish in 1841. By 1851 Joseph (32) and Emma (30) were living in Coventry with their daughter Emma Tarrant (9). By 1861 Joseph was keeping a public house in Coventry as well as making shoes, and there were two more children: Martha Jane Tarrant (9) and Julia Tarrant (7). Josiah's wife died in 1864 and in 1871 Josiah (52) was living at East Street, Coventry with his children Emma (27), Julia (16), and Amy (2). In 1881 he was in Coventry with his daughter Martha (19). By 1891 he was living with his married daughter Julia Storey (33) and her family in Manningham, near Bradford, Yorkshire. He was still with them in Bradford at the age of 85 in 1901, and he died in that area in 1905. Margaret Tarrant, Mrs Wethered or Weatherhead (born 1823) was living at Sunningwell, Berkshire in 1851 with her husband Henry, who was a papermaker, and their children Ann Elizabeth Tarrant (7), Margaret Esther Tarrant (6), Henry Alfred Tarrant (4), Alfred Tarrant (2), and Joseph Evans Tarrant (seven months). In 1861 they were living in south Oxford (New Hinksey) with their children Margaret (26), Henry (24), Joseph (20), Edward (19), and William (13). In 1881 Henry (61) and Margaret (57) were living alone, and their address was more precisely given as Tenby Cottage, Abingdon Road. Margaret's husband Henry Weatherhead died in the Abingdon district (probably in the Abingdon Road) near the beginning of 1897 at the age of 78, and Margaret Weatherhead appears to have died in Oxford Workhouse on the Cowley Road on 3 Jun 1899. Esther Hannah Tarrant, Mrs Watson (born 1826) was living in Garsington in 1861 with her husband Josiah , who was a corn & flour merchant, and their children Josiah James Tarrant (8), Esther Alice Tarrant (6), Thirza Ann Evangeline Tarrant (5), Alice Elizabeth Tarrant (3), John Joseph Tarrant (2), and Laura Lucy Tarrant (four months), plus a servant. They emigrated to the USA in 1868. Mrs Esther Hannah Watson died in Chicago in 1912. Joseph Evans Tarrant (born 1829) went back to Australia with his wife Caroline soon after their marriage in 1855, and Joseph worked as a miner and later owned three newspapers. They had five children there: Caroline (1856), Joseph (1858), Harley (1860), Elizabeth (1862), and Ernest (1864, died in infancy). Joseph Evans Tarrant died at Box Hill, Victoria on 27 June 1889. His son Harley became famous for the development and manufacture of the Tarrant car: see his entry in the Australian Dictionary of Biography. Benjamin Tarrant (born 1834), who had emigrated to Australia at the age of 19 in 1853, married Mary Ann Easton in Buninyong, Victoria on 14 November 1855, and they had thirteen children in Australia: Esther Jane Tarrant (1856), James Benjamin Tarrant (1857), James Tarrant (1859), Clara Kate Tarrant (1861), Jane Tarrant (1863), Benjamin Tarrant (1865), Benjamin Tarrant (1867), Henry Tarrant (1869), Charles Henry Tarrant (1871), Albert Tarrant (1874), Ernest Tarrant (1874), Florence Evelyn Tarrant (1876), and Henry Campbell Tarrant (1877). Benjamin later worked as a fruiterer, and then a publican. Benjamin Tarrant died in New Zealand in 1875. Isaac Tarrant (born 1837), who had emigrated to Australia at the age of 15 in 1853, became a gold digger. In about 1855 when he was aged 19 he married Caroline Walker (24) and they had the following children in Australia: Alfred Tarrant (1856), Isaac Tarrant (1859), Samuel John Tarrant (1861), Carol Tarrant (1862), Alice Mary Tarrant (1865), Josiah Tarrant (1868), Henry Tarrant (1871), Albert Evans Tarrant (1874), and Ernest Evans Tarrant (1880). Isaac Tarrant died at Ballarat, Australia in 1907. Samuel John Tarrant (born 1840), who had emigrated to Australia at the age of 12 in 1853, married Amelia Ann Pook on 7 July 1861, when he was working as a miner. They had fifteen children in Australia: Samuel Schmeding Tarrant (1862), Amelia Louisa Tarrant (1864), Florence Eveline Tarrant (1866), Ada Tarrant (1868), Eliza Emeline Tarrant (1870), Ernest Constantine Tarrant (1871), Albert Edwin Tarrant (1873), Grace Eva Tarrant and Albert Edwin Tarrant (1874), Frederick William Tarrant (1876), Alice Maud Tarrant (1877), May Lilliance Tarrant (1879), Leslie Charles Tarrant (1881), Gertrude Miriam Tarrant (1883), and Arthur Clarence Tarrant (1886). Samuel John Tarrant died in Australia at Kew in Victoria in 1917.